1915hrs No birds showing over a 20 minute period. 1000hrs A solitary bird was seen flying around the Kings/Manor house areas. 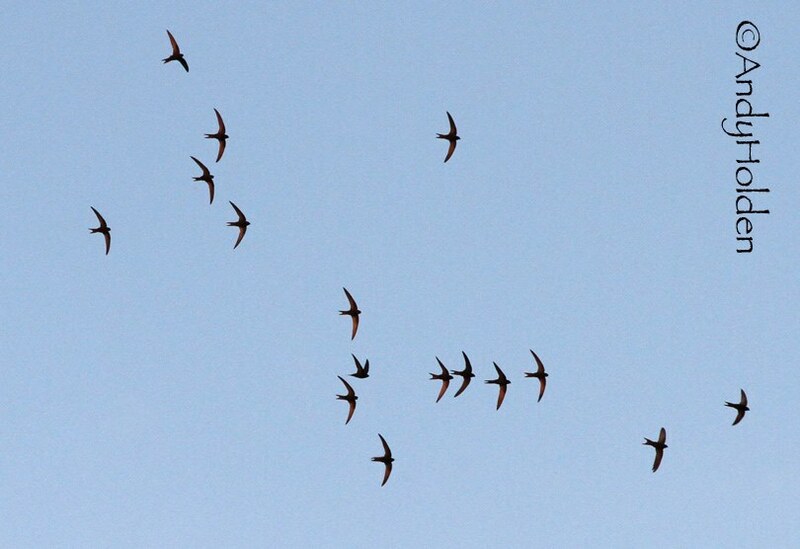 2015hrs 12 Swifts in the skies. At least 10 over the Memorial Hall area and a further two between the Royal and Kings areas. 0910hrs 10 Swifts in the skies between Memorial Hall and Kings. A party of 6 birds chasing and screaming around the Royal area. 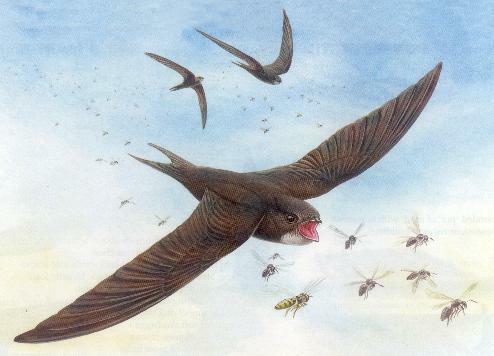 1945hrs 7 Swifts in the skies between Neddy Hill and the Kings area. Also one came out of nest site at the front of the Royal. It looks very much like the majority of the birds (probably up to 30 or more) could well have left us yesterday (Saturday 28th July 2018). We did get the impression on Fridays watch that the birds were getting fidgety with lots of irregular aerial swirling movements and perhaps this was signs of collective preparation in readiness for a long haul exit. On Saturday 28th July 2018 the following records: 4841 Swift went through Spurn (Yorks), 860 Swifts went over Bury (Lancs). Far reduced sightings were given for the proceeding Friday 27th and following on Monday 30th so it looks like the first big leave happened on Saturday 28th with a lesser move on the Sunday 29th which ties in exactly with our Burton Birds exit. Dear Bryan, Many thanks for your message. Yes we have been receiving and enjoying your messages. It is fantastic all the detailed observations you have been making of nest sites.I like your system of adding the dates on in red. 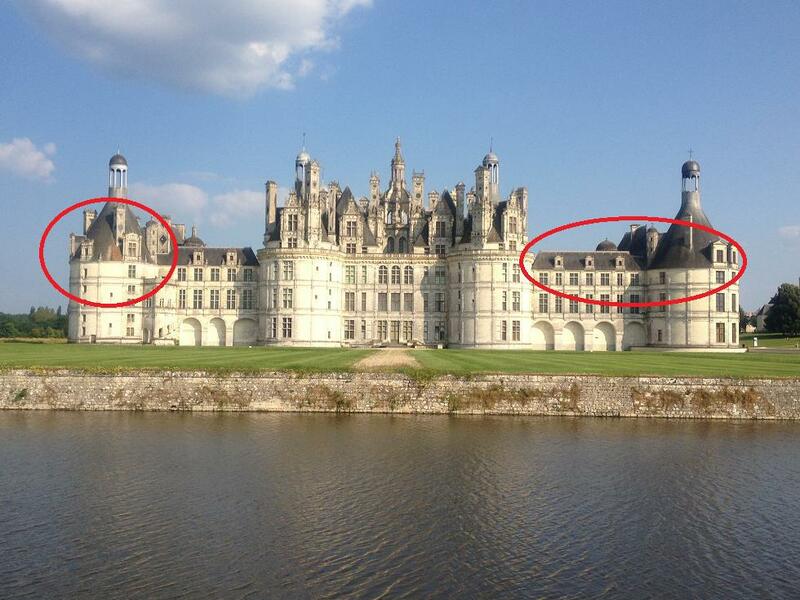 We have been busy here contacting château de Chambord ( an incredible place built by François 1 in the 16 th century as a hunting lodge and set in a huge walled park that covers the same area as the city of Paris !). We had discovered that through total ignorance of the existence of swifts nesting there they had been filling in their nest holes when doing renovation work. So 4 of us spent half a day there doing a detailed survey of the site. It was quite a business to get permission & clear security etc.but we had perfect weather conditions & the swifts were there ! Anyway, I attach the photos.These have gone by registered post to a whole long list of people including the builders who are working on the place. Meanwhile virtually all the swifts left here last week with the main bunch on the 24 th July.This is about a week sooner than last year. It now feels very quiet ! Again it was a lovely warm evening throughout the watch although it had become quite cloudy. We had at least 40 Swifts flying high and there could well have been more, it proved so difficult to count. We had lots of low screaming parties, the largest party we counted was 8. We witnessed one bird leave the Post Office cottages and we also saw another one going into its nest site on Hangings Farm in Cocking Yard. We spent a little while at Cocking Yard and then moved over to the rear of the Royal and stayed there for quite sometime, but never saw any Swifts entering or leaving their nest sites which we thought unusual for the length of time we had spent there, and this had us wondering whether or not the birds had actually already left their nest site. We did see two birds at the entrance to one of the nest sites last week as though they perhaps could have been preparing to leave. Tonights observers were: Reg Hesketh, Branwen Kilburn, Maggie, Angela Sumner, Bryan Yorke.